Built using groundbreaking ideas, the MacBook Pro is not only stunningly sleek and featherlight, it also features upgrades like a better-than-ever display and the much-awaited Touch Bar for instant access to tools! 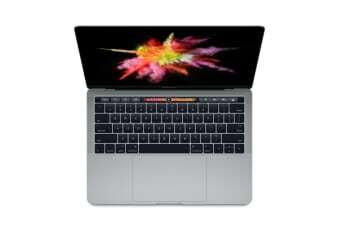 The Apple 13” MacBook Pro gets you working smarter to increase productivity! Featuring marked improvements on its predecessors, the 2016 model boasts of a brighter, more colourful display, a more accurate touchpad, and graphics that are up to 130% faster! And the list of improvements doesn’t stop there. It also features speakers that are up to 58% louder, high-performance processors, Touch ID and so much more! What’s more, with an impressive battery life of up to 10 hours, you can enjoy all of these all day! Change how you use your everyday apps with this fabulous innovation called Touch Bar. It makes the standard function keys at the top of the keyboard obsolete! The Touch Bar changes according to your activity and gives you the tools you need exactly when you need them. Now, browsing, typing emojis, and adjusting system controls are all so much more efficient than before. Plus, with the new fingerprint ID, you can enjoy one-touch login access and even purchase via Apple Pay.